Even before her election as bishop of the Minneapolis Area Synod of the Evangelical Lutheran Church in America (ELCA) in 2012, the Rev. Ann Svennungsen had a varied and interesting career. In addition to pastoring four very different congregations in vastly different circumstances, she had been the CEO of the Fund for Theological Education in Atlanta and the president of Texas Lutheran University in Seguin. A Montana native with deep Minnesota roots, she announced soon after her election her intention to visit every synod congregation within the first two years of her bishopric. 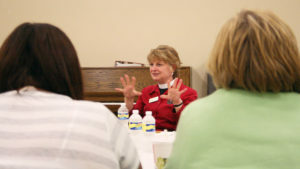 Her commitment to congregational life is central to her ministry as bishop. “I have a strong conviction that the local community of faith is a miracle,” she told Metro Lutheran during a visit to two ELCA congregations — East Union Lutheran and West Union Lutheran, both in Carver County — late last summer. The ELCA recognizes three levels, or expressions of the church: the congregation, the synod (or regional body), and churchwide (the national organization). As bishop, Svennungsen has a responsiblity to administer the resources of the the synod, to be a pastor to its pastors, and to provide a direction for common mission. Still, her love for the local parish as the center of ministry drives her vision of what the church can be. 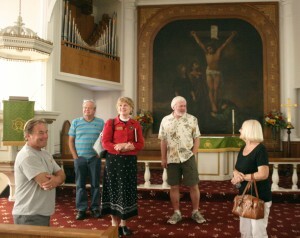 Svennungsen visits with members of West Union Lutheran Church, Cologne, Minnesota, on August 29, 2013. She can be self-critical about synodical activity. “Some congregations primarily interface with the synod when it wants something [from them],” she acknowledged. “As I have been visiting local congregations this last year, many of the members I meet with are surprised that I do not talk about mission support; I am not asking them for money. Svennungsen has now visited 133 of the 155 congregations in the Minneapolis Area Synod. The Rev. Lee Ann Pomrenke, pastor of River of Life Lutheran Church in north Minneapolis, schedules her visits with congregations, generally on Tuesday and Thursday afternoons. Pomrenke tries to find two congregations located near enough that the bishop can have a significant visit with members of both in the allotted time. The congregation’s pastor and/or church council determines which members will meet with the bishop. Groups have ranged from “a few” to 16 people. Normally, elected leaders are included. Janet Thompson, MAS assistant to the bishop, said that the bishop is beginning a new initiative. When a congregation completes its self-study during a call process, Svennungsen goes to visit with its leaders about their sense of mission and their expectations for pastoral leadership. “It’s a good time to have an intimate connection with a congregation,” Thompson explained.